The show's obsession with urban violence is not just a fantasy of superhero fans. It's also a popular narrative sold by law and order politicians. "Realism," Ambrose Bierce said, is "the art of depicting nature as it is seen by toads." In that vein, most if not all of the Netflix Marvel shows depict a concrete and filth-strewn New York as it is seen, not by toads, but by Jeff Sessions. In the newly released season three of “Daredevil,” for example, realism means unstoppable violent crime, and the need for equally violent and unceasing policing. “Daredevil” is a long, grimy love letter to law and order policies, up to and including mass incarceration. “Daredevil” creates a sense of realism partly through visceral, feel-every-rib-break action sequences. The first six episodes available for preview are saturated with the series' trademark set pieces. 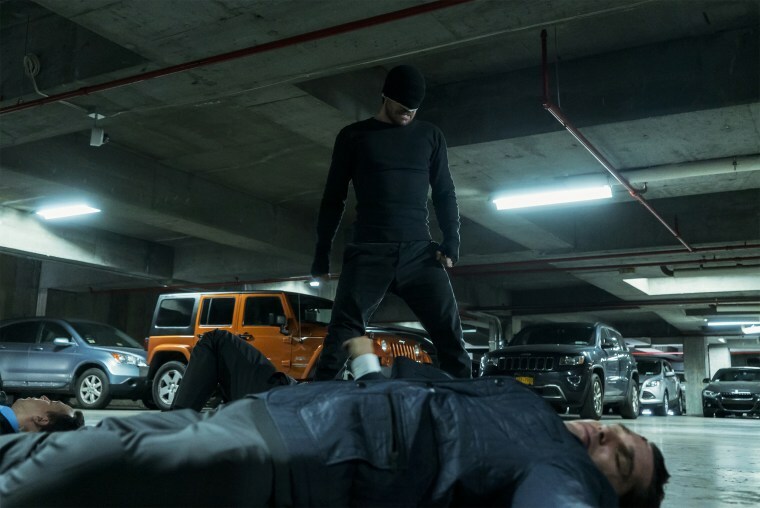 In one memorable battle scene, Matt Murdock/Daredevil (played by Charlie Cox) and three antagonists beat each other until they can't stand, and then continue the slugfest crawling around on the floor, lurching and staggering in an exhausted ballet of brutality. This fight choreography is vital to the show’s grim and gritty aesthetics. So is the depiction of criminal gangs. Marvel films use cosmic threats, sentient robots and even extradimensional demons to give the stories an air of expansive possibility and bigger-than-life goofiness. In contrast, Netflix Marvel series like “Luke Cage” and “Iron Fist” focus on ground level narratives in which ruthless Chinese and Jamaican criminal gangs square off over every block of turf. The first half of “Daredevil” season three focuses on a conflict between a cartel of Albanians and a nefarious organization led by season one villain Wilson Fisk (played with brilliantly methodical menace by Vincent D'Onofrio). The superpowered hero, with his enhanced senses, is made plausible by the milieu of low-lifes who surrounds him. Criminals, murderers, thugs, pushers, toughs and desperadoes are real, and in “Daredevil,” they are everywhere. But is it actually realistic to have criminals everywhere? The fact is that violent crime in American cities has been declining for around 30 years. Urban areas have experienced a wave of revitalization and development. Organized criminal gangs have eroded; large scale drug cartels have disintegrated into small, mostly leaderless clusters. Gun violence in poor neighborhoods in cities can still be devastating and horrific, but the uncontrollable ethnic gang problem in “Daredevil” feels like something out of the 1920s, rather than a portrayal of present day city life. Netflix's Marvel shows in general, and “Daredevil” in particular, present themselves as realistic. But really they're exercises in hyperbolic, fantasy nostalgia, exaggerating memories of a more violent, more bloody urban past. Netflix's Marvel shows in general, and “Daredevil” in particular, present themselves as realistic. But really they're exercises in hyperbolic, fantasy nostalgia. Fiction doesn't have an obligation to accurate reporting, obviously. “Daredevil” ramps up crime for the same reason the Marvel universe pretends intergalactic space invaders exist — as a way to create conflict and stimulating storylines. The problem is that the "stimulating storyline" of hyperbolic urban violence and decay is not just a fantasy of superhero fans. It's also a popular narrative sold by law and order politicians looking to stir up racist resentment. President Richard Nixon developed his so-called war on drugs as a way to target black protestors and black communities. More recently, President Donald Trump has tried at every turn to associate immigrants with criminality and violence — infamously claiming that Mexican immigrants were rapists during the 2016 campaign. “Daredevil,” filled as it is with violent ethnic groups murdering FBI agents in a lawless urban dystopia, is a Trumpian fever dream. Worse, that fever dream explicitly justifies harsh violations of civil liberties in the name of law and order. “Daredevil” is arguably the most ideologically pro-torture network television show since “24,” — cop procedurals like “Chicago PD” notwithstanding — and the third season upholds that tradition. In one scene, Murdock strangles a black defense attorney in order to get him to violate attorney-client privilege. Torture is presented as both effective and necessary — a false and dangerous myth. “Daredevil” loves torture; it also loves imprisonment. Wilson Fisk, the kingpin of crime, is rotting in maximum security for life after his criminal enterprise unraveled at the end of season one. But early in season three, Fisk agrees to start sharing information with the FBI, and shortly afterwards he's targeted for murder within the prison. To keep him safe, the FBI moves him to another building, effectively placing him under a kind of house arrest. The conditions of the house arrest are shown to be unpleasant and humiliating. Fisk expresses remorse for his past actions and starts providing material help to catch other criminals and save lives. Yet, the series treats the transfer of Fisk from one prison to another as a disastrous moral failing. The main protagonists — including defense attorney Foggy Nelson (Elden Henson) — all insist that any mitigation of Fisk's sentence is a betrayal of justice. Foggy even launches a campaign for district attorney based on law and order fearmongering and pandering to the police union. In his inaugural speech he promises to "put Wilson Fisk into the deepest hole allowable under the Eighth Amendment." When district attorneys make promises like that, there are concrete consequences. Scholar John Pfaff has explained that mass incarceration has mostly been driven, not by drug arrests, but by longer and longer sentences for people who commit violent crimes. We've decided over the last 30 years that violent criminals are ubiquitous, unstoppable and irredeemable, and that to balance the scales of justice they must be punished as harshly as possible, forever. Today, we have 2.3 million people in prison — up from around 150,000 in the notoriously violent and crime ridden 1920s. Of course, the heroes are right; Fisk is not actually remorseful and is plotting against them. The defense attorney Daredevil tortures is evil and corrupt and deserves what he gets. It was a mistake to move Fisk from his prison. The plot is arranged so that torture and tough on crime rhetoric are grim and gritty truths. The heroes are just being realistic — which, again, in this context, means that they see the world from the perspective of law and order demagogues. The superpowered Netflix Marvel series aren't true-to-life depictions of cities, or of criminality, or of human beings. But we are building prisons as if they are.